Resistance is futile! NoStar Trek fan can pass up the opportunity to own theultimate Borg action figure! 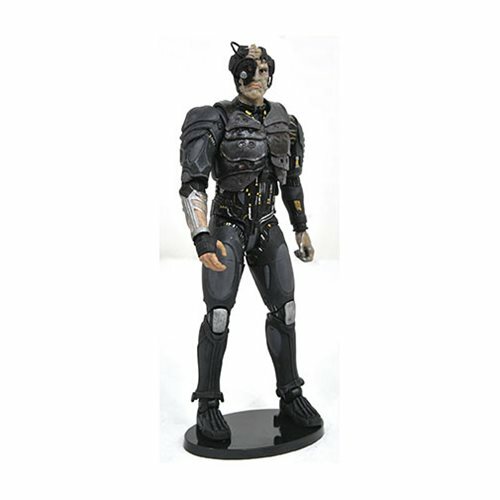 This 7", fully poseable actionfigure is based on the Borg's appearance in Star Trek: TheNext Generation, and includes multiple interchangeableparts, including human and Klingon heads, variouseyepieces, different tool arms and a removable vest. Youcan create dozens of different configurations and build anarmy of Borg! With a full 16 points of articulation, this figurecomes packaged in display-ready Select figure packagingwith side-panel artwork.